Blackberries are edible fruit produced by many species in the genus Rubus in the family Rosaceae. Hybrids among these species within the subgenus Rubus, and hybrids between subgenera Rubus and Idaeobatus also exist. Take a look below for 26 more fun and fascinating facts about blackberries. 1. What distinguishes the blackberry from its raspberry relatives is whether or not the torus, or stem, stays with the fruit. 2. 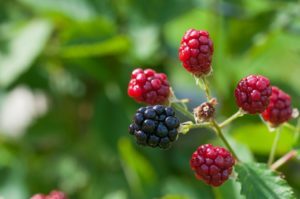 When you pick a blackberry fruit, the stem stays with the fruit, while when you pick a raspberry, the stem remains on the plant, leaving a hollow core in the raspberry fruit. 3. 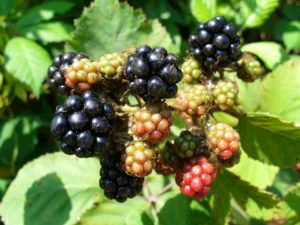 The term “bramble,” a word meaning any impenetrable thicket, has traditionally been applied specifically to the blackberry or its products, though in the United States it applies to all members of the Rubus genus. 4. In the western United States, the term “caneberry” is used to refer to blackberries and raspberries as a group rather than the term bramble. 5. The usually black fruit is not a berry in the botanical sense of the world. Botanically, it’s termed as an aggregate fruit, composed of small drupelets. 6. Blackberries, like most berries, are very high in antioxidants, fiber and a variety of other health promoting nutrients. 7. 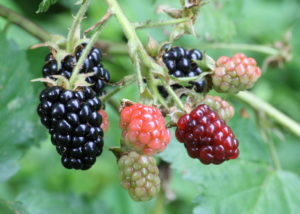 Blackberries have been consumed for centuries, and in the United Kingdom folklore exists about when blackberries should no longer be consumed each year. 8. Some traditions suggest that blackberries are representative of the blood of Christ. Some also believe that the crown of thorns that was placed on Christ’s head for his crucifixion was made of blackberry brambles. 9. 100 grams of whole blackberries contains 14% of the recommended daily intake of fiber in one’s diet. 10. 100 grams of blackberries contains 23 milligrams of vitamin C, which is equal to 35% of the recommended daily intake. 11. In addition to vitamin C, blackberries also have vitamin A, vitamin E, and vitamin K.
12. Blackberries contain copper, which is essential for bone metabolism. It’s also essential to the production of white and red blood cells in the body. 13. 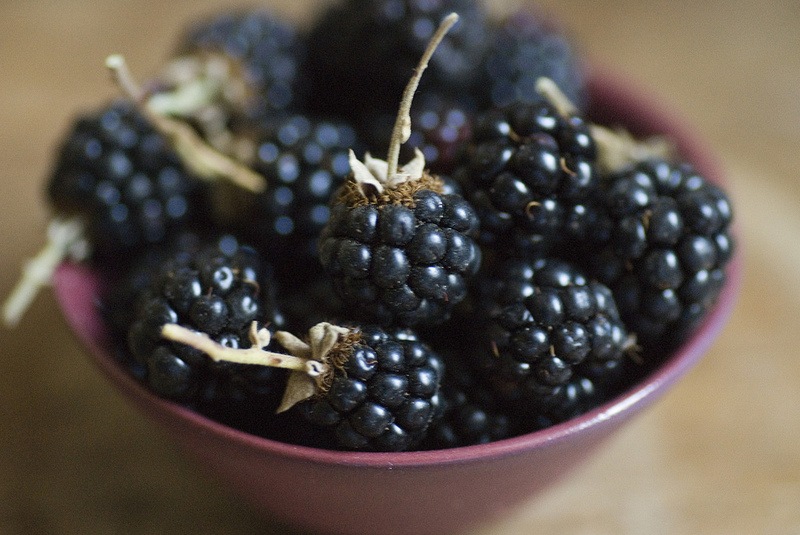 Blackberries contain B vitamins, folic acid, riboflavin, pantothenic acid, and niacin. There are all essential for metabolizing carbohydrates, fats and protein in the body. 14. 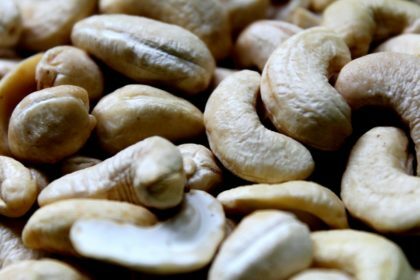 They’re generally in season from June until September, depending on the region that they grow in. 15. They’re very perishable and will only last for a few days once picked. Blackberries are best eaten as soon as possible after picking for maximum freshness and taste. 16. The very dark color of blackberries is evidence of the high antioxidant levels contained in the fruit. 17. 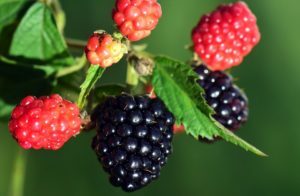 Other names for blackberries include lawers, thimbleberries, dewberries and brambleberries. 18. Blackberries have been used by women in labor to help relieve labor pain as they have high levels of vitamin K, which can act as a muscle relaxant. 19. Blackberries have slightly higher levels of antioxidants than blueberries. 20. Evergreen blackberries are considered to be anti-viral, anti-bacterial, and anti-cancer because of the level of ellagic acid that they have. 21. The nutrients in blackberries contribute to improved immune function, improved digestive health, healthy heart function, cancer prevention, weight management, strong bones, improved eyesight, proper blood clotting, healthier skin, improved memory, and various cognitive benefits. 22. Blackberry leaves are food for certain caterpillars, and some grazing mammals such as deer. 23. Blackberries grow wild throughout most of Europe. They’re an important element in the ecology of many countries, and harvesting the berries is a popular pastime. 25. In various parts of the United States, wild blackberries are sometimes called “black-caps,” a term more commonly used for black raspberries. 26. There is evidence from the Iron Age Haraldskaer Woman that she consumed blackberries about 2,500 years ago.